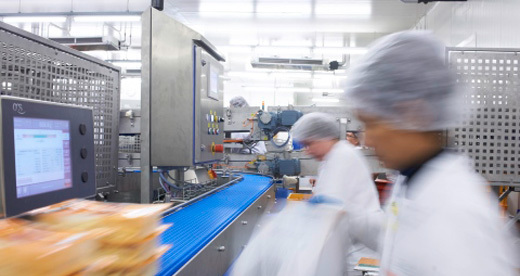 Food processing is a competitive sector that demands high levels of efficiency to meet daily production targets. Unplanned downtime due to component failures is not an option! A keen focus on productivity is one reason why breakdowns of critical control and automation equipment are such a cause for concern. The cost of the breakdown includes the cost of repairing or replacing damaged components and the cost of lost manufacturing time. Stopping one line, even in a small food producer, can cost thousands of pounds for every hour that it doesn’t restart. Enclosures protect sensitive electronic and electrical items, providing an environment that allows them to function as required and prolonging their service life. Maintaining an internal temperature within required parameters is very important. In manufacturing faciliities, this often requires an active cooling solution because heat is trapped inside enclosures designed to protect against the ingress of solid objects and water. This is a particular problem for enclosures in washdown areas, which need to maintain an IP69K protection rating. As the temperature rises due to the summer months or random heat waves throughout the year, internal temperature parameters can be breached. This in turn, reduces the life expectancy of the equipment within the enclosures, dramatically increasing the probability of a system failure. Care needs to be taken when selecting climate control equipment to ensure it is robust enough to handle the rigours of your specific application. Below are some key aspects to consider when reviewing your climate control solutions. Is it the right solution for your environment? The type of product being processed and/or the location of the equipment are likely to have a heavy influence on the suitability of your climate control system. 1) Let’s consider the ambient temperature of your facility. If it remains lower throughout the entire year than the desired temperature inside the enclosure, then fan-and-filter units and air-to-air heat exchangers can be particularly effective. They use ambient air to remove heat energy from the enclosure and dissipate it into the local environment. If the ambient temperature rises above the required internal temperature then units with active cooling circuits must be used. Wall/roof-mounted cooling units remove excess heat from enclosures, transferring it to the surrounding ambient air, and maintain the desired conditions. Air-to-water heat exchangers, as the name suggests, transfer unwanted heat to water, transporting it away from the enclosure to a centralised cooling plant, possibly outdoors, where it may be more easily dissipated. Air-to-water heat exchangers are also a more hygienic solution than cooling units which don’t require a supply of ambient air and therefore have no louvres. They can have a simple housing that has no dirt traps and is easy to clean. Already in 2018, we have seen average temperatures increasing across the country and this could increase as we move into the summer months. Peaks in temperature put cooling equipment under the most strain, therefore reviewing your existing equipment sooner rather than later can reduce the likelihood of unexpected breakdowns. Establishing a regular inspection and cleaning routine for cooling equipment is very good practice. For example, vacuum cleaning units with filter mats to remove any dust and debris which may starve the fan and the cooling circuit of air. This will result in the unit working harder for longer and a reduced cooling capacity. It’s important, from both an environmental and a cost saving standpoint, for food and beverage producers to adopt energy efficient technologies. With rising energy prices it’s vital that the energy consumed by manufacturing processes is reduced where possible. The Rittal Blue e+ cooling unit incorporates heat pipe technology and delivers cooling in a similar manner to an air-to-air heat exchanger, using fans alone when the ambient temperature is sufficiently low. As the ambient temperature rises and the heat pipe can’t satisfy demand, speed-controlled components provide additional mechanical cooling, but only as much as is needed. If the ambient temperature exceeds the temperature required in the panel, active cooling alone is supplied, but no more than is necessary. Many food production facilities work around the clock and throughout the whole year. Heat pipe and inverter technology allow the Blue e+ to uniquely capitalise on the daily and seasonal temperature fluctuations in your factory, typically delivering energy savings of 75%. Of course, the best course of action is to undertake a survey of your existing cooling equipment, taking into account the points discussed here. Rittal are happy to offer you a free RiAssure Cooling Inspection , for which one of its trained representatives will visit your site and provide you with honest, clear advice on your existing equipment and its suitability within the chosen environment/process. 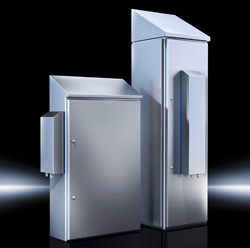 Rittal will then provide you with a short report with feedback on the next steps for your site, whether it is implementing a maintenance contract to prolong the life of existing equipment, or replacing units that are undersized to improve performance and increase the energy efficiency of your site. If you have any questions about Rittal Hygienic Design enclosures, or would like to arrange a free Rittal RiAssure Cooling Inspection, give us a call on 01254 685900 and one of our sales or technical support engineers will be happy to help.